Here’s something new — I just finished a book called A Funeral of Feuds. It’s free on Amazon Kindle until Friday 12 October, so grab yourself a free copy while it’s still available. For Adam Bennett, life is somewhat troublesome, and it’s about to get even worse. Returning to his childhood home for his mother’s funeral, Adam finds himself once again under the same roof as his dysfunctional family. While he finds some escape in a curious encounter with an old acquaintance, the situation soon spirals out of control. Between his derisive siblings, an unexpected guest with a burning grudge, and his brother-in-law’s fear of clergy, this funeral might just have the elegance of a man backing his car down the motorway. 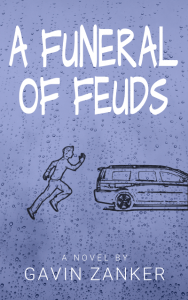 With healthy doses of irony and fatalism, A Funeral of Feuds offers an absurd comedy with laugh-out-loud moments that’s sure to go down well with anyone fond of British humour. A Funeral of Feuds Copyright © 2018 Gavin Zanker.